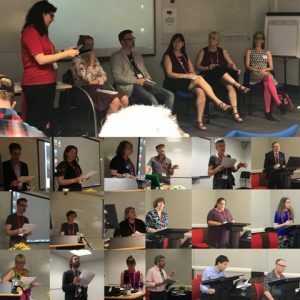 After six wonderful Tolkien sessions at Leeds 2018 (you can read a round-up of all paper sessions here: http://dimitrafimi.com/tolkien-at-imc-leeds-2018-round-up/) it’s now time to start preparing for Tolkien at IMC Leeds 2019 (the IMC is scheduled for 1-4 July 2019). This session will focus on recent works by J.R.R. Tolkien, posthumously published and authorized by the Tolkien Estate. Many of these volumes include Tolkien’s translations or creative retellings of medieval material, and many of them were written or revised during the period when Tolkien was lecturing at the University of Leeds. Papers can focus on (but are not restricted to) The Fall of Arthur (ed. Christopher Tolkien, 2013), Beowulf: A Translation and Commentary (ed. Christopher Tolkien, 2014), The Story of Kullervo (ed. Verlyn Flieger, 2015), A Secret Vice: Tolkien on Invented Languages (ed. Dimitra Fimi and Andrew Higgins, 2016), The Lay of Aotrou and Itroun (ed. Verlyn Flieger, 2017), The Tale of Beren and Lúthien (ed. Christopher Tolkien, 2017) and The Fall of Gondolin (ed. Christopher Tolkien, 2018). Tolkien spent most of his lifetime inventing an extended mythology which displays an impressive array of “secondary world infrastructures” (Mark Wolf, Building Imaginary Worlds, Routledge, 2012). Central in this world-building are the different cultures of Middle-earth, who not only have their own histories, genealogies, and languages, but also their own material cultures, from monuments, architecture, ruins, and manuscripts, to food, clothing, and other quotidian artefacts. Apart from these “internal materialities” (i.e. existing within the context/conceit of Tolkien’s secondary world and its cultures) there is also Tolkien’s own creative process and its accompanying “external materialities” (i.e. external to the secondary world) such as Tolkien’s own hand-written/-drawn sketches, drafts, maps, and “feigned” manuscripts, and their role in the building of his legendarium. This session will explore Tolkien’s legendarium with an emphasis on internal and external materialities. Papers can focus on topics such as artefacts within the fictional context of Middle-earth (including cultural/gendered/economic/archaeological artefacts), as well as Tolkien’s external creation of artefacts (maps, feigned manuscripts, drawings, etc. ), many of which have been seen for the first time in the recent exhibition “Tolkien: Maker of Middle-earth” (Bodleian Library, Oxford, June-September 2018; soon to travel to The Morgan Library & Museum, New York, January-May 2019). This session can accommodate wider topics and new approaches to Tolkien’s medievalism, ranging from source studies and theoretical readings, to comparative studies (including Tolkien’s legacy). This round table discussion will provide a forum for new scholars in Tolkien Studies to share innovative approaches, new ideas, and underexplored areas of research. We strongly encourage early career researchers to share their expertise and research for this round table discussion (e.g. scholars who completed their PhD within the last year, independent scholars who have published during the last three years, etc.). I look forward to receiving your abstracts!